Complete information on recreational angling regulations for these species, and others, can be found by visiting maine.gov/dmr/recreational-fishing or by contacting the Maine Department of Marine Resources, 32 Blossom Lane, 21 SHS, Augusta, ME 04333-0021, (207) 624-6550. There are several species of migratory fish (such as shad, river herring/alewives, striped bass, and sea-run Atlantic salmon) that are regulated by the Maine Department of Marine Resources and may be found in the inland waters of Maine. 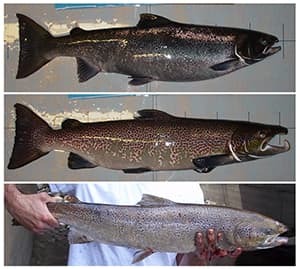 Sea-run Atlantic salmon occur in many of Maine's inland waters where landlocked Atlantic salmon and brown trout may also exist. Sea-run salmon are listed as endangered by the U.S. Fish and Wildlife Service and therefore may not be fished or harvested. Sea-run salmon exhibit a variety of color phases (see pictures) from black to silver to brown, and can look similar to brown trout and landlocked salmon in coloration. Therefore, establishing a 25 inch maximum length limit (S-33) on waters where adult sea-run Atlantic salmon may occur ensures anglers will not inadvertently "take" a misidentified endangered fish. Any sea-run Atlantic salmon incidentally caught must be released immediately, alive and uninjured. At no time should sea-run Atlantic salmon be removed from the water.